We used to think that people who thought the Earth was flat were uneducated. But Thomas Friedman's best-selling book, The World Is Flat (2005), helped us to understand that if the world is not exactly flat, then it is deeply interconnected as never before. Friedman's book described how technology and the fall of trade barriers have led to the integration of markets and nations, and enabled individuals, companies, and nation-states to reach around the world faster and cheaper than ever before. We see evidence of this interconnectedness in our lives every day—from the food we eat to the coffee we drink to the clothes we wear. Sports teams recruit talent from around the globe, and the iPhones we use to communicate are manufactured in more than 19 different countries. This transformation of the world has happened relatively recently and in a short period of time. The economic liberalization of China beginning in the 1980s, the development of democracy in South Korea in 1987, and the fall of the Soviet Union and the development of free trade treaties in the early 1990s introduced 3 billion people, previously locked into their own national economies, into the global economy. Harvard economist Richard Freeman calls this the "great doubling" of the global labor force (National Governors Association, Council of Chief State School Officers, and Achieve, Inc., 2008, p. 9). In the late 1990s, the wiring of the world in preparation for the "millennium bug" unleashed another set of sweeping changes, as did the 2001 accession of China to the World Trade Organization and the 2003 economic liberalization of India, which jump-started that country's tremendous growth. The results have been staggering. Twenty years ago, bicycles were China's primary method of transportation, the G7 group represented the most powerful nations on earth, and the World Wide Web was just a proposal (McKinsey, 2011). Who at that time would have imagined the dramatic skyline of Shanghai today, that the G7 would become the G20, and that mobile web use would be growing exponentially around the world? The effects of globalization have been far-reaching. While the living standards of the world are still highly uneven, 400 million people have moved out of extreme poverty since 1980—more than at any other time in human history. The growth and urbanization of a global middle class is creating huge new markets for goods and services of all kinds. Since 2000, despite frequent political and economic crises that cause it to dip temporarily, the global economy has been expanding (Zakaria, 2008). The world's economic center of gravity is also shifting: 50 percent of growth in gross domestic product (GDP) occurs outside the developed world, a fact that is fundamentally changing business models. Already, one in five U.S. jobs is tied to exports, and that proportion will increase (U.S. Census Bureau, 2004). Globalization is often viewed as a zero-sum game in which one nation's economic growth comes at the expense of another. But the reality is more complicated than that. While manufacturing has largely moved out of the developed world into countries with lower labor costs, the exponential growth of the economies of India and China and the smaller-scale growth of other economies such as Russia and Brazil, have also created enormous demand for U.S. products—high-end industrial goods, cars, luxury items, agricultural products, and so on—and have increased the numbers of tourists coming to the United States and the numbers of undergraduate and graduate students flocking to American universities. Large multinational companies from other countries are building plants and providing jobs in the United States, and the lower prices of consumer goods from abroad benefit the American consumer. Still, while the global integration of economies has created complex webs of capital, trade, information, currencies, services, supply chains, capital markets, information technology grids, and technology platforms that form a more intricate, multifaceted system than a model of simple economic competition among nations, the competition for industries and for high-skill, high-wage jobs has undoubtedly become more intense. This intensified competition stems from several sources. First, automation has eliminated large numbers of lower-skill jobs—far more than outsourcing has, in fact. Second, the "death of distance" caused by the global spread of technology, which makes it just as easy to create a work team around the world as it is to create one across a company, has put American workers in direct competition with workers elsewhere. Work that can be digitized can now be done with the click of a mouse by anyone from virtually anywhere in the world. Jobs in medical diagnostics, architectural drawing, filmmaking, tax preparation, and call centers are some of the types of occupations that have been outsourced. American students today are therefore competing not just with students in the city or state next door but with students in Singapore and Shanghai, Bangalore and Helsinki. As the economy has become not just more global but also more knowledge based, the skill mix in the economy has changed dramatically. The proportion of workers in blue-collar and administrative support positions in the United States dropped from 56 percent to 39 percent between 1969 and 1999, leaving a trail of rust-belt neighborhoods and cities. Meanwhile, the proportion of jobs that are managerial, professional, and technical increased from 23 percent to 33 percent during the same period (Levy & Murnane, 2004). Skill demands within jobs are increasing too. Jobs that require routine manual or cognitive tasks are rapidly being taken over by computers or lower-paid workers in other countries, while jobs that require higher levels of education and more sophisticated problem-solving and communication skills are in increasingly high demand. The jobs that once supported a middle-class standard of living for workers with a high school diploma or less have substantially disappeared. These new economic realities and rapid shifts in the job market are fundamentally changing what we need from our education system. The rapid increase in emerging markets also means economic growth and the need to prepare students for jobs that require new skill sets. According to the Committee for Economic Development (2006) "to compete successfully in a global marketplace, both U.S.-based multinationals as well as small businesses, increasingly need employees with knowledge of foreign languages and cultures to market products to customers around the globe and to work effectively with foreign employees and partners in other countries" (pp. 1–2). And it is not just the economy that has become more global. The most pressing issues of our time know no boundaries. Challenges facing the United States—from environmental degradation and global warming, to terrorism and weapons proliferation, to energy and water shortages, to pandemic diseases—spill across borders. The only way to address these challenges successfully will be through international cooperation among governments and organizations of all kinds. As the line between domestic and international continues to blur, American citizens will increasingly be called upon to vote and act on issues that require greater understanding of other cultures and greater knowledge of the 95 percent of the world outside our borders. In the 20th century the United States was "the most powerful nation since Imperial Rome" (Zakaria, 2008, p. 217), dominating the world economically, culturally, politically, and militarily. While the United States still remains a military superpower and supports the world's largest economy, the rapid economic growth and expansion happening in other countries show that a country's global position cannot be taken for granted. A great transformation is taking place around the world—and it is taking place in education, as well. In the second half of the 20th century, the United States was indeed the global leader in education. It was the first country to achieve mass secondary education. And while European countries stuck to their elite higher education systems, the United States dramatically expanded higher education opportunities through measures like the G.I. Bill after World War II. As a result, the United States has had the largest supply of highly qualified people in its adult labor force of any country in the world. This tremendous stock of highly educated human capital helped the United States to become the dominant economy in the world and to take advantage of the globalization and expansion of markets. However, over the last two decades, countries around the globe have been focused on expanding education as the key to maximizing individual well-being, reducing poverty, and increasing economic growth. Under the Education for All initiative, one of the United Nations' Millennium Development Goals, nations have joined together with the goal of providing universal primary education in every country, especially the poorest countries, by 2015. Although there is still a long way to go to meet this goal, particularly in sub-Saharan Africa, among girls, and in war-torn areas, more than 33 million children were added to school rolls between 2000 and 2008 (UNESCO, 2010). Countries in the middle tier of economic development aspire to universal secondary school graduation. And the most developed countries have set the goal of greatly increased levels of college attendance. Because of dramatic global educational gains, high school graduation has now become the norm in most industrialized countries. The Organisation for Economic Co-operation and Development (OECD) reports that by 2009, the United States had fallen from 1st in the world to 8th in the proportion of young adults (ages 18 to 24) receiving a high school diploma within the calendar year. This lower position does not indicate a drop in U.S. graduation levels; rather, it testifies to the success other nations have had ambitiously expanding their secondary school systems and raising their graduation rates. Although the United States actually showed a modest increase in secondary school graduation from 1995 to 2009, this achievement is dwarfed by the striking gains of a number of countries (see Figure 1). Among the 28 OECD countries with comparable data for 2009, the United States ranked 12th in the percent of the overall population (including adults over the age of 24) achieving secondary school graduation, which is 15 or more percentage points behind countries such as Portugal, Slovenia, Finland, Japan, Ireland, and Norway (OECD, 2011). Source: Data from Table A2.1 (Upper secondary graduation rates  and Table A2.2 (Trends in graduate rates at upper secondary level [1995–2009]. OECD. (2011). Education at a Glance 2011: OECD Indicators. Paris: OECD Publishing. The pace of change in high school graduation in some countries has been astounding. For example, two generations ago, South Korea had a similar economic output to Mexico and ranked 24th in education among the current 30 OECD countries. Today, South Korea is in the top 10 countries in terms of high school graduation rates, significantly ahead of the United States (Uh, 2008). At the higher education level, the United States has a strong system that is admired around the world and is a world leader in research. According to the 2010 Times Higher Education World University rankings, 18 of the top 20 universities in the world were in America. And the United States is among the world leaders in the proportion of 35- to 64-year-olds with college degrees, reflecting the enormous expansion resulting from the G.I. Bill and, subsequently, the large numbers of people in the baby boom generation who went to college. But the United States falls to 10th place in the rankings when it comes to the proportion of younger adults age 25 to 34 who have an associate's degree or higher (National Center for Public Policy and Higher Education, 2008). As recently as 1995, the United States tied for first in university and college graduation rates. But by 2008, it ranked 15th among 29 countries with comparable data, behind countries such as Australia, New Zealand, Japan, United Kingdom, Switzerland, and France. In the 1990s, when the importance of a highly educated workforce in the global economy was becoming ever clearer, other countries began to dramatically expand their higher education systems, as the United States had done in earlier decades. But during that period, there was almost no increase in the college-going rate in the United States. In addition, U.S. college dropout rates are high: only 54 percent of those who enter American colleges and universities complete a degree, compared with the OECD average of 71 percent. In Japan, the completion rate is 91 percent (National Center for Public Policy and Higher Education, 2008). Overall, the United States has lost ground in such international comparisons as the pace of higher education expansion has accelerated around the globe. While older generations of Americans are better educated than their international peers, many other countries have a higher proportion of younger workers with completed college degrees (National Center for Public Policy and Higher Education, 2008; see Figure 2). This development of educated talent around the globe means that, going forward, the United States will not have the most educated workforce in the world as it has had in the past. Nowhere is this expansion of education more dramatic than in Asia. The rise of Asia is one of the most critical developments of the late 20th and early 21st centuries. From 1980 to 1990, Japan boomed, with world-class companies like Sony, Honda, Toyota, and Nissan achieving great success in industries where the United States had once been dominant. The so-called "Asian tigers"—South Korea, Singapore, and Hong Kong—leapt forward and developed influential economies out of all proportion to their tiny size. China's GDP tripled between 1980 and 2003, increasing from USD$12 trillion to USD$36 trillion, making it the world's second-largest economy; it is expected to grow to USD$60 trillion by 2020 (Tierney, 2006). If current economic growth rates continue, it's only a matter of time before China overtakes the United States as the world's largest economy. Since India liberalized its economic policies in 2003, its economy, like China's, has been growing at a rate of 8 to 9 percent per year; by 2030, India is expected to overtake China as the nation with the largest population in the world, leading it to become a potentially even more significant player in the global market. During this period, hundreds of millions of people have risen from poverty to form an enormous new middle class. But while Asia's extraordinary economic growth is the stuff of daily business headlines, less well-known is the region's equally remarkable educational trajectory. Of the 65 countries and provinces participating in OECD's 2009 Programme for International Student Assessment (PISA), the results of which were released in December 2010, most of the top performers were in Asia. Shanghai and Hong Kong led the way, followed by Singapore, South Korea, and Japan. In terms of scale, the challenge to the United States has only just begun. A fundamental shift in the global talent pool is under way. Looking ahead to 2020, the U.S. proportion of that global talent pool will shrink even further as China and India, with their enormous populations, rapidly expand their secondary and higher education systems (see Figure 3). In the Cultural Revolution of the 1960s in China, there were almost no students in school. Today, nine years of basic education are universal in all but the most remote areas, and China's goal is to have 90 percent of students in upper secondary school by 2020. If the U.S. high school graduation rate remains flat and China continues on its current path, China will be graduating a higher proportion of students from high school within a decade. And China has 200 million students in elementary and secondary education, compared with our about 66 million. Source: From "Seeing U.S. Education Through the Prism of International Comparison" (slide 13). Presentation by A. Schleicher at a meeting of the Alliance for Excellence in Education, Washington, DC, October 4, 2007. Adapted with permission. At the college level, according to the Chinese Ministry of Education, China has more than 82 million people who have received higher education, a small proportion of the population but still a number greater than America's 31 million college graduates. China expanded the number of students in higher education from 6 million in 1998 to 31 million in 2010, going from almost 10 percent to about 24 percent of the age cohort (Chinese Ministry of Education, 2010; see Figure 4). And many of these students are studying science and engineering. Harold Varmus, Nobel laureate, head of the National Cancer Institute, and cochair of the President's Council of Advisors on Science and Technology, observed, "In the 20th century, U.K. observers saw U.S. education as overtaking the United Kingdom. In the 21st century, arguably, China may soon be exceeding the United States in education" (Varmus, 2009). Source: From "Seeing U.S. Education Through the Prism of International Comparison" (slide 14). Presentation by A. Schleicher at a meeting of the Alliance for Excellence in Education, Washington, DC, October 4, 2007. Adapted with permission. India has been behind other countries in expanding secondary education; currently, only 40 percent of students of an age to be enrolled in secondary school actually are. But having succeeded in massively expanding primary education over the past two decades, India is now making major investments in secondary education, with the goal of universalizing lower secondary education by 2017 and sharply increasing enrollments in upper secondary school. The Indian government established a National Knowledge Commission (2006–2009) to make recommendations for policies that would help establish a "vibrant, knowledge-based society" based on research, technology transfer, and knowledge and skill development and, thus, strengthen India's competitive position in the global knowledge economy (National Knowledge Commission, 2009). According to Montek Singh, deputy chairman of the Indian Planning Commission, "India is on the threshold of launching a new secondary education program, where we will deliberate, among other things, on how to achieve world class standards in science, math, and technology and how to build an education environment that fosters innovation" (Asia Society, 2008b, p. 6). At the higher education level, less than 10 percent of the age group is enrolled in postsecondary education, and many college courses are considered of low quality and relevance. However, India's elite Indian Institutes of Technology, modeled on the Massachusetts Institute of Technology and other premier scientific and technical institutions around the world, have produced graduates who have created software development and research and development companies from India to Silicon Valley, and who have catapulted into leading posts in global firms. Not only is the United States falling behind in terms of education quantity, but there is also increasing alarm about the quality of its education. A range of international assessments reveal disturbing weaknesses in American K–12 students' performance compared to that of their peers in other countries. Three different international testing programs measure student performance in reading, math, and science on a regular basis. Trends in International Mathematics and Science Survey (TIMSS), a test of science knowledge in 4th, 8th, and 12th grades, and the Progress in International Reading Literacy Study (PIRLS), a test of 4th grade literacy, are produced by the International Association for the Evaluation of Educational Achievement (IEA). The Programme for International Student Assessment (PISA), produced by OECD and administered every 3 years, measures performance in math, science, and reading for 15-year-olds. These tests are administered to a randomly selected sample of students within the countries they assess so that their results can be generalized to the larger population. After successive administrations, the results of these tests provide a picture of how countries are changing over time in various areas. Beginning in 1995, with the most recent cycle of assessments taking place in 2007, TIMSS uses multiple-choice questions to assess learning of the science and math content commonly found in most countries' school curricula in particular grades. (A list of countries participating in TIMSS can be found online at http://nces.ed.gov/timss/countries.asp.). Students in the United States perform better on TIMSS than on PISA (see below), coming in 9th place in 8th grade math and 11th place in 8th grade science in 2007 (Quek et al., 2008), in part because not all of the higher-performing industrialized countries participate in TIMSS, and also because American students are used to multiple-choice tests that ask them to reproduce curriculum content. However, when the United States' TIMSS performance was compared with that of only the most developed nations in 2003, it ranked below the average of the 12 countries (Ginsburg, Leinwand, Anstrom, & Pollock, 2005). The second cycle of PIRLS took place in 2006 in 40 countries (participants can be found at http://pirls.bc.edu/pirls2006/countries.html). PIRLS measures 4th grade reading and tries to determine how policies and practices in and out of schools relate to reading engagement and achievement. The United States tends to do better on international assessments of reading than of math and science. In fact, it ranked 18th out of 40 countries, above the average performance. However, whereas other countries showed significant improvement between the two cycles of PIRLS, U.S. performance remained flat. The most widely used global student measures are the PISA assessments from OECD, which began in 2000 measuring performance in 43 countries and subsequently grew to include 60 countries and 5 nonnational systems in its 2009 surveys. Together, these countries constitute 90 percent of the global economy. In 2009, a number of provinces in mainland China took part in the PISA surveys for the first time, and India is planning to participate in future surveys. PISA truly has become a global education report card. The PISA assessments, given to 15-year-olds, differ from TIMSS in that their goal is not primarily to measure subject matter knowledge but to determine how well students near the end of compulsory schooling apply their knowledge to real-life situations. The emphasis is therefore on understanding of concepts, mastery of processes, and real-world problem solving. PISA reports the average score for students in each country and identifies the top performers (levels 5 and 6) and poor performers (levels 1 and 2). The most recent United States performance on PISA (OECD, 2010b) is disappointing, to say the least, in all three subject areas (see Figure 5). Source: Comparing countries' performance in reading, mathematics, and science (Figures 2.16, 2.17, and 2.18). OECD (2011b), Lessons from PISA for the United States: Strong Performers and Successful Reformers in Education. Paris: OECD Publishing. http://dx.doi.org/10.1787/9789264096660-en. Used with permission. Science. In science, U.S. students ranked 17th among OECD member countries in 2009 (23rd among all nations and provinces taking the test). The U.S. score of 502 is average among OECD members. However, 18 percent of U.S. students did not reach level 2, considered the baseline level for being able to use science and technology in everyday life. This was an improvement from 24.4 percent in 2006. At the top end of performance, the United States has roughly the same proportion of high scorers as in 2006, with 10 percent of students reaching levels 5 and 6. Compare this figure with 28 percent in Shanghai, China, and 22 percent in Finland. Math. In math, the United States ranks 25th among OECD member countries (31st among all nations and entities taking the test). The U.S. score of 487 is below the average for OECD member countries, with 23.4 percent of students not reaching baseline level 2. Only 12 percent of American students reach level 5 or 6, compared with 50 percent in Shanghai, China, and over 30 percent in Singapore and Hong Kong, China. Reading. In reading, the United States ranks 14th among OECD member countries. The U.S. score of 500 is average for OECD countries and is unchanged since 2000. Eighteen percent of American students do not reach baseline level 2 in reading and are therefore unlikely to be able to cope with postsecondary education or training. However, with 11.5 percent of students reaching levels 5 and 6, the United States has an above-average share of the highest performers—though it still ranks below Australia, Canada, and Singapore (OECD, 2011b). The United States is not among the top performers in any of the three subjects tested by PISA. Despite some improvements in science, U.S. performance is average at best and largely flat. While small differences in scores on the PISA scale matter little, the performance gap between the United States and top-performing nations is huge. American students lag a full year behind their peers in the countries that score highest in math. Factoring into the U.S. performance are large variations in scores by region and by socioeconomic status. In other nations, large enough samples of students take the test to enable comparisons among states or provinces. The United States' sample size is not commensurately large, but the sample does enable approximate regional estimates that show that states in the Northeast and Midwest do better than states in the West or South. U.S. average performance is also strongly affected by the high proportion of students achieving scores at the bottom two levels. This continuing class- and race-based achievement gap means that we are failing to prepare large numbers of our young people, especially those in our minority communities, for postsecondary education or training. But we also lack a high proportion of students who reach the top skill levels that are critical for innovation and economic growth. Even our best and brightest are not achieving the way they should be. In sum, the results from the world's global education report cards show that American students are not well prepared to compete in today's knowledge economy. A host of developed nations are surpassing us in education. These results are especially disturbing in light of the fact that the United States reports the world's second-highest per-pupil expenditure. What Can We Learn from International Comparisons? Other countries test a more select group of students than the United States does. This was true for the early TIMSS assessments in the 1980s but is not, by and large, true today. According to Jim Hull, who examined international assessments for the National School Boards Association, "Since the 1990s, due to better sampling techniques and a move by more countries to universal education, the results represent the performance of the whole student population, including students who attend public, private, and vocational schools; students with special needs; and students who are not native speakers of their nation's language" (NGA et al., 2008, p. 20). Other countries are less diverse than the United States. The United States is a diverse country, but so are most industrialized countries these days due to greatly increased international migration. While some countries that outperform the United States are culturally homogeneous, like Finland, many are not. In 2006, of the 11 other OECD countries that, like the United States, had a student population that was 10 percent immigrant, all performed higher that the United States in math and 9 performed higher in science. In addition, a lack of diversity is not a guarantee of educational success. Finland used to have relatively low-quality schools despite its cultural homogeneity. Its high performance today can be traced to education policies put in place over the past 20 years. The assessments favor test-oriented cultures like those in Asia. The highest-performing countries or regions—Finland, Canada, Japan, Shanghai, Hong Kong, Singapore, Australia, and New Zealand—exist on four continents with different cultural backgrounds. Wealthier countries spend more on education than the United States does. The United States is wealthier and spends more on education than most other countries. Among the 30 OECD countries, the United States has the highest GDP per capita and the second-highest educational expenditures. Only Luxembourg spends more per student. The United States' poor performance is due to high levels of poverty, not low levels of school quality. In every country, students from higher-income backgrounds achieve at higher levels than lower-income students. As the United States has a highly unequal income distribution, this is certainly a factor in U.S. performance. However, even America's most affluent students do not do as well as affluent students in other industrialized nations. Also, while the United States does not have a higher proportion of disadvantaged students than many other countries, the socioeconomic differences translate more strongly into student performance. In other words, the educational policies and practices of other countries do a more effective job of supporting lower-income students and equalizing educational opportunities. There are clear limitations to these international assessments. One is that they only regularly measure three subject areas. It is possible that if other areas were measured, American students would perform better than students from other countries. For example, an IEA study of citizenship education found that American students perform relatively well compared with their international peers in their understanding of democratic institutions, an important goal of schooling (Torney-Purta, Lehmann, Oswald, & Schulz, 2001). However, they performed far less well in knowledge of other countries, an increasingly important need in the 21st century. And although there are no international assessments of proficiency in non-native languages, examining other countries' policies shows that most industrialized countries require study of a second language starting in elementary school and continuing for several years, whereas fewer than half of all American high school students take even one year of a foreign language, usually at the introductory level (American Council on the Teaching of Foreign Languages, 2010). What this means is that many of the students in high-performing countries who do well in math and science are also able to function professionally in another language. 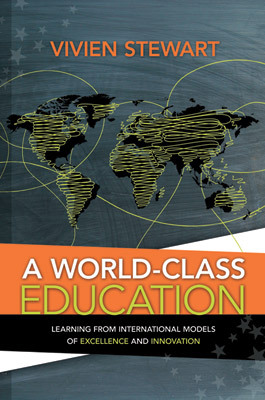 It is also possible that international assessments do not capture characteristics of American schooling that may be very important in a global knowledge and innovation economy, especially the encouragement of creativity, independence of thought, and a wide range of talents through a broad curriculum and menu of extracurricular activities (Zhao, 2009). The breadth of the American school curriculum is traditionally one of its strengths (although the increase in high-stakes testing of a limited range of subjects is reducing that breadth). Clearly, international assessments do not measure everything. However, those areas they do measure—reading, math, and science—are certainly critical indicators of the quality of an education system. The PISA tests, in particular, are constructed to measure the kind of problem-solving and application skills that are essential to creativity and are increasingly being called for by educators, policymakers, and the business community. What can we learn from international comparisons? Parents, teachers, and education policymakers are looking for information on how well schools are preparing their students for life. Most countries have national data and reports, such as the National Assessment of Educational Progress (NAEP), which allow states, for example, to compare the performance of their schools with other states. But international comparisons enable us to look at educational performance in a much broader context. In the past, such comparisons were largely of interest to academics, but the advent of a global knowledge economy has given us a critical "need to know." Today, PISA results show what is possible in education: that countries can achieve both excellence and equity. The repeated administration of these tests and the development of large-scale databases over time also allow us to see that significant change is possible and enable countries to gauge their progress against the most successful education systems in the world. Finally, they enable us to consider a wider range of policy options against a broader base of evidence as to "what works." Countries also face common challenges. Societies everywhere are becoming more heterogeneous. And as skill sets change and people press for greater opportunities, governments everywhere experience similar difficulties in increasing quality, effectiveness, and accountability. There is a rich conversation to be had about approaches to new challenges. Other sectors of American life routinely study international trends in their fields; it is surprising that U.S. education has not been informed by international experience. How much impact does the educational quality of a nation's schools have on economic prosperity? This is a key question. Some people argue that the relationship is not that important, pointing out that despite the United States' mediocre performance on international tests since A Nation at Risk was published in the early 1980s (National Commission on Excellence in Education, 1983), the nation has still prospered economically. Although true in some respects, what this argument doesn't take into account is the time lag between the population's education levels and the country's economic output. In other words, America still enjoys a higher proportion of older adult workers with high school and college diplomas than its international counterparts. We have not yet seen the impact of a U.S. workforce that is less well educated than that of many other countries. Certainly, a nation's economic growth is influenced by more than its educational level, and the United States has a favorable economic climate in many other areas. Despite the excessive risk taking of American banks that led to the financial crisis of 2008, the United States' legal and financial systems, large supply of capital, research and technologies companies, and culture of entrepreneurialism are second to none and can, to some extent, compensate for a weaker K–12 education system. The United States is ranked fourth in the World Economic Forum's 2010–2011 Global Competitiveness Index precisely because of these factors (Schwab, 2010). However, the global competitiveness report also notes that America's costly but unproductive education and health systems constitute threats to its competitiveness and a reason for companies not to locate here. And despite the fact that the U.S. economy has grown overall in the last two decades, large sectors of the economy have moved to other parts of the world, where companies find not only cheaper labor but increasingly highly educated knowledge workers. If the cost to society is significant, the monetary cost to an individual student of low educational performance is also extremely high. A high school dropout in 2005 had an average annual income of $17,299. If that student had graduated, he or she would have earned $26,933—a difference of $9,634. Having an associate's degree raised the average income to $36,645, and a bachelor's degree brought in $52,671 (U.S. Census Bureau, 2006). High school graduates also contribute more to the society through their increased purchasing power and taxes. They are less likely to become teen parents, they raise healthier children, and they are less likely to be in prison or rely on government food or housing programs. Dropouts not only earn less but also are more likely to be unemployed. In the 2009 recession, the rate of unemployment for dropouts was 15.4 percent, compared with 9.4 percent for high school graduates and 4.7 percent for college graduates (U.S. Bureau of Labor Statistics, 2009). Princeton University researcher Cecelia Rouse calculated that each dropout costs society $260,000 (Rouse, 2005). If you multiply the number of dropouts by that amount over a 10-year period, the cost to society is on the order of $3 trillion (Alliance for Excellent Education, 2009). That is one measure of the economic cost of the United States' low global ranking in high school graduation rates. There are economic costs and benefits not only to the amount of education, as measured by high school and college graduation rates, but also to the quality of education. Drawing on research conducted over the past 10 years on why some countries have succeeded economically while others have not, the Hoover Institution's Eric Hanushek and the University of Munich's Ludger Woessman used economic modeling to relate cognitive skills as measured by PISA and other international assessments to economic growth of OECD countries. Their analysis showed that relatively small improvements in the skills of a nation's workforce can have a large impact. For example, if all OECD countries boosted their PISA scores by 25 points over the next 20 years, a growth surpassed by Poland between 2000 and 2006, there would be an aggregate gain of $115 trillion over the lifetime of the generation born in 2010. Bringing all countries to the average performance of Finland, one of the consistently top-performing countries on PISA, would result in gains of about $260 trillion (OECD, 2010a). This analysis also showed that it is the quality of learning outcomes, not the length of schooling, that makes the difference. Naturally, there is uncertainty in these projections, and there are lively disagreements among economists about how to do economic modeling. However, even if these projected benefits are reduced to minimal estimates, the reports indicate that the costs of improving schools would be more than paid for by future economic growth. In the economies of the past, which were based on raw materials, primary production, or manufacturing, the role of human capital was less important. But in today's knowledge-based economies, human capital is a critical ingredient in economic growth, productivity, and innovation. For most of the second half of the 20th century, Americans believed—and rightly so—that ours was the best education system in the world. But the concern that the United States is losing its edge has been growing steadily more urgent. The warning salvo fired by A Nation at Risk, with its famous threat of the "rising tide of mediocrity," has grown to a barrage of unease in reports like Rising Above the Gathering Storm (National Academy of Sciences, 2005), which argues that the United States is losing its lead in science, and Tough Choices or Tough Times (National Center on Education and the Economy, 2007), which argues that the U.S. standard of living will fall without radical reforms to increase educational performance and innovation; books by individual scholars like Linda Darling-Hammond (2010a), which make the case that America must seriously commit to equity to succeed in the "flat" world; and films like 2 Million Minutes, written by software entrepreneur Bob Compton, which focuses on the ambition and hard work of Indian and Chinese high school students. This issue weighs heavily on the minds of parents, too, who wonder if the United States can maintain an educational system and economy that will allow their children to have a good standard of living in a world that is completely transformed from the world in which they grew up. Reflecting this escalating concern about the need for dramatic improvement in U.S. education, President Barack Obama said, "In a 21st century world, where jobs can be shipped wherever there's an Internet connection, where a child born in Dallas is now competing with a child in New Delhi, where your best job qualification is not what you do, but what you know, education is no longer just a pathway to success; it's a prerequisite for success" (Obama, 2009). Arguing that the No Child Left Behind legislation, with its emphasis on closing achievement gaps in basic skills, was not ambitious enough, he went on to call for the development of a "world-class education system," reducing the high school dropout rate, and once again making the United States first in the world in college graduation rates. A world-class education system should not just be defined by rates of high school and college graduation but also by the quality of its educational outcomes and whether the content and skills are adequately preparing students for a rapidly changing global environment. The education system in the United States has many strengths that should not be underestimated, but it also has major weaknesses. We cannot afford to rest on our past educational accomplishments. Over the past two decades, tectonic shifts have occurred in the economic and educational landscape of the world. The global context has changed, global educational standards have changed, and the skills needed to be successful in the global knowledge economy have changed. But while the world has altered so dramatically, our schools have not. Just as a market leader in the corporate world can get eclipsed by newer companies, the American school system has been overtaken in many areas. The future of the economy, jobs, and other national challenges is always unpredictable, but a good education is the best tool we have to prepare the next generation of Americans for the rapidly changing world. The next chapter looks at how a number of countries, selected from many different parts of the globe, have successfully developed education systems that outperform the United States and produce more equitable outcomes at lower cost. It also considers the challenges that face these systems and presents takeaway lessons for American educators.